Genghis is a set of extensions built on top of .NET and integrated with WinForms to provide application-level services in the same flavor as the Microsoft Foundation Classes. Genghis gets its name as the functional heir to Attila, a similar set of functionality built on top of ATL. Most of the Genghis classes were built by different folks and while every effort was made to keep things consistent by choosing .NET and WinForms design techniques, everyone does things their own way. This work is the work of the individuals involved and does not represent any contribution of their respective employers. You are under no obligation to use any of Genghis at any time, but if you do, you are required to abide by the License. You can download the latest Genghis source code from here. The Genghis archive includes this page, the source code to the Genghis class library, a series of samples showing off the various classes and a pre-built, signed version of genghis.dll in the redist folder. Notice that some of the samples use the Genghis files directly instead of using the compiled Genghis assembly. Either usage is supported by Genghis (except where it drives the WinForms Designer nuts). Genghis source code control has been moved to the Genghis CodePlex workspace. Thanks to GotDotNet and Rob MacFadyen for hosting the previous versions. Genghis is written in C#. Building Genghis requires Visual C# or Visual Studio.NET. Visual Studio.NET solution and project files (*.sln and *.csproj) are provided to build Genghis and all the samples. You should be able to load any solution file into Visual C#/Visual Studio.NET and build the project for yourself. A NAnt build script (Genghis.build) is also provided. It is used to make the snapshot for Genghis, and is not designed for general use. You may wish to use this file to simulate the snapshot build process; please be aware that you will not be able to properly sign the release mode Genghis DLL (the private key is not provided in this distribution). For Visual Studio.NET related build issues, please contact the Off Topic Windows mailing list. This is where the Genghis contributors have their discussions, and most of them will be familiar with Visual Studio.NET builds of Genghis. If you have NAnt related build issues, you should contact Mike Marshall (the Genghis build master) directly. Thanks to Brad Wilson for the NAnt build scripts for folks without VS.NET. Bugs will now be kept in the Bug Tracker section of the GDN Workspace. Please do not send Chris Sells or any of the other contributors personal email complaining about Genghis. Also please do not post Genghis bug reports to any mailing list. A much better way to contribute to the life of Genghis is to submit the fix along with the bug report. Submissions should be in the Genghis namespace (I don’t think we’ll have to worry about collisions… : ). Submissions should be single-file and stand-alone as much as possible. The goal is that Genghis can be built as a DLL and used as a whole or that bits of its source can be pulled into individual projects as needed ala atl.dll vs. atlwin.h. All code should be commenting using C# doc comments so that docs can be generated via Tools->Generate Source Comments. All source code files should include the copyright and license notice. All code shall be set to use spaces, not tabs, and a vanilla coding style. When hacking on existing code, thou shall conform to the existing coding standard of the file. Many coding standards are readable, but not when mixed. If you’d got something you’d like to see contribute to Genghis, please let me know (multiple people are free to collaborate on a single feature). Matthew W. Adams et. al. Managed HTML display ala a C# port of Mozilla? Note: Anything marked with “sample” means that there’s a sample included with Genghis that shows the current implementation of a feature but that it’s not done enough to be part of the official Genghis component. Mostly the hold-up is integration with the WinForms Designer. The Genghis documentation is composed of the C# documentation comments as part of the automated build. Check redist\Genghis.chm for the latest. Title bar that shows the document with the current focus along with a dirty indicator, i.e. the asterix. Edit Undo, Cut, Copy and Paste. Status bar that updates when menu items or toolbar items are in “focus”, as well as showing NUM, SCROLL and CAPS as these keys change. Since Microsoft has shown that no one looks at the status bar much, the auto-update as items come into focus is not a feature that needs to be duplicated in WinForms/Genghis. The current .NET implementation of SimplePad is now available as one of the Genghis samples. Thanks to Paul Bartrum and Chris Burrows for all their hard work on this! Chris Sells’s newly improved WebCommandLineHelper class which now works with .NET 1.0 and 1.1, includes URL decoding and requires no additional permissions (although it does require a server-side HTTP handler, included as the ConfigFileHandler class that maps requests for foo.exe?bar=quux.config to the foo.exe.config file). Added EnvironmentDefaults: string in ParserUsageAttribute, allows the user to specify defaults in an environment variable (ala DIRCMD). CVS repository available, as provided by our rmTrack sponsor, along with extensive CVS docs from Brad Wilson. MRU support from Michael Weinhardt, including both in-menu and sub-menu support. A much more robust set of validation components from Michael Weinhardt (Michael’s been busy : ) modeled along the lines of the ASP.NET validation components, including required, regex, range and comparison validators. FileDocument component from Chris Sells for document/dirty bit handling. Wizard support from Shawn Wildermuth, including changing page groups on the fly! Custom state treeview from Chris Sells so that you can set and show all three checkbox states. 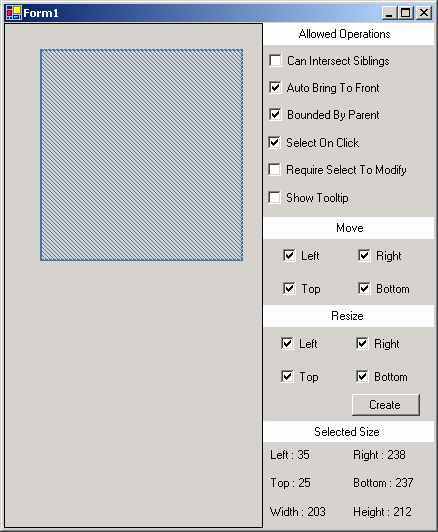 A class to expose the WinForms HandleCollector from Ethan Brown so that you can put your own custom resources into it. A Screen Saver class from Shawn Van Ness. A bunch of file utility classes from Ethan Brown, including retrieving mapped drives, retrieving shares and path resolution b/w UNC, local (including SUBST, etc). A cursor changer class that works with the using block by Shawn Wildermuth. A WebCommandLineHelper class from Chris Sells to parse command line arguments from the URL used to launch href-exes. Update to the FileNameDialog from Deepak Shenoy to include newish flags. Updated ListViewSorter to be declarative. Look for Designer support ASAP. Generated new genghis.key and removed it from the distribution. Brad Wilson, our new Build Master, contributed a Nant build. Paul Bartrum and Chris Burrows contributed a mostly-complete .NET implementation of SimplePad, along with some sample command updating and cool menus implementations. Paul Bartrum also provided a window serializer and a preference class. Michael Weinhardt contributed an MRU sample. I contributed a custom state treeview useful for things like tri-state checkboxes. rmTrack provided the initial hosting space and administration support for Genghis bug tracking and source code control. Th is software is provided ‘as-is’, without any express or implied warranty. In no event will the authors be held liable for any damages arising from the use of this software. This license based on the open source zlib/libpng license. The idea was to keep the license as simple as possible to encourage use of Genghis in free and commercial applications and libraries, but to keep the source code together and to give credit to the Genghis contributors for their efforts. While this license allows shipping Genghis in binary form, if shipping a Genghis variant is the sole purpose of your product, please contact The Genghis Group for a new license.